A horse that drifts over fences can’t use his full physical potential ability. Indeed, when he drifts to the right or the left over fences, the horse takes off pushing asymmetrically with his rear legs which leads to a loss of energy and a jump of a lower quality. Long term, this issue can lead to articular and tendinous strains. Therefore, it is important to keep the horse straight on the approach, over the fence and on the landing. 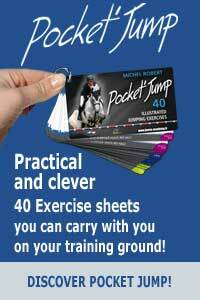 To get your horse really straight is also essential when jumping combinations. Indeed, if the rider is not paying attention and let the horse drift over the first fence, the issue will get worse on the second fence and then the third one. In that set-up, the horse will end-up running out. Michel teaches Dominique who is riding Haiti. The goal of this session is to encourage the mare to jump in the centre of fences and to push with her hind legs symmetrically over fences. To keep Aiti straight when she jumps, Michel has set-up a grid that will encourage the mare to stay centred through the lines. 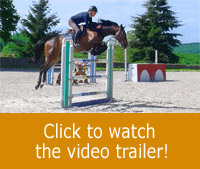 The exercise offers a solution to the drifting that is based on the rider’s mind and position. That will greatly limit the rider’s influence and therefore her interference with the mare’s mind and freedom of movements.